Spinach, feta cheese, and Kalamata olives belong together! 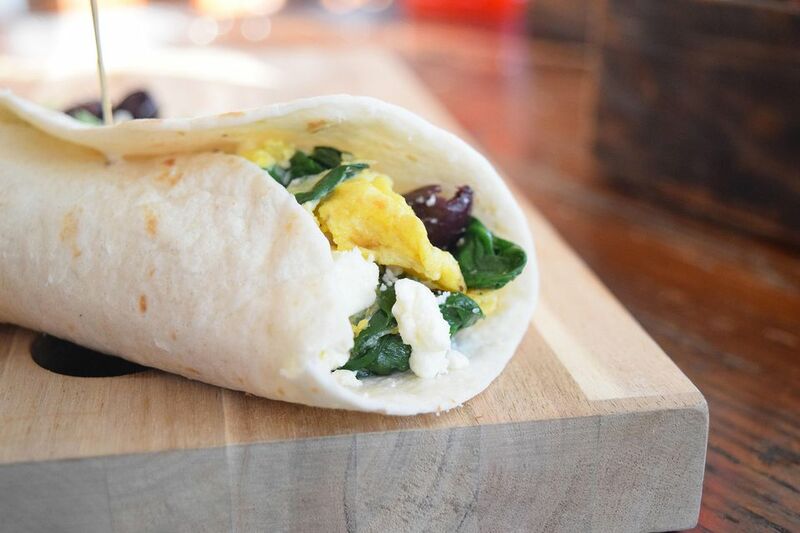 They taste delicious in this healthy, hearty, and wholesome breakfast wrap! When my husband and I honeymooned in Greece we loved eating eggs with Kalamata olives and feta! The cheesy, salty, tangyness combined with freshly scrambled eggs is so delicious! The spinach adds in some green and packs a healthy punch because it is iron-rich! This wrap is super easy to whip together on a weekday morning. You can also make a bunch of these on the weekend and then wrap them and freeze them! They can be reheated in the microwave or toaster oven. Simply scramble more eggs and have plenty of tortillas on hand! Egg whites can also be substituted. There is always a debate as to whether whole eggs or egg whites are better for you! I go for the whole eggs to get the nutrients from the yolks, but either way packs a ton of protein! Heat a small saute pan to medium heat. Add 1/2 of a tablespoon of butter to the pan. Let the butter melt and swirl it to coat the pan. Scramble the eggs in a small bowl. Add in the rest of the butter chunks and salt and pepper. Add the egg mixture to the pan. Let the eggs cook for a moment and then gently push them with a spatula to allow the raw egg to cook in the pan. Just before the eggs are cooked, add in the spinach and combine until the spinach and egg are cooked. Remove the eggs from the heat and lay them over the tortilla. Top the eggs with the feta cheese crumbles and chopped Kalamata olives. Wrap together and serve! It may also be frozen and reheated!